Who has owned/driven a 190E 2.3-16? Looking for some comments on the 190E 2.3-16, either US-spec or Euro-spec. Would like to hear from anyone who has owned or driven one. Are they fun cars? I know they aren’t as sporty as an E30 M3, but I figure they must still be entertaining, especially compared to a lot of newer cars these days. Any comparisons would be great. It's kind of like what you said. Roughly the same power as the E30M3, but far less sporty and without the brilliant handling of the E30M3. By today's standards it feels quite slow in acceleration, which a stock E30M3 does also, but the E30M3 kind of makes up for it when pushed to the limit. For me, the 190E 2.3-16 did not. It feels heavier than an E30M3, not as responsive, etc. I can say this...the 190 was for years a car I really wanted. After driving it, I no longer lusted after one much. Although I have to admit the one I drove was a fairly tired example. If you wanted an '80s DTM homologation car to use as a DD, the 190 might be a better choice than the E30M3. It is more civilized, less buzzy, etc. It is also less entertaining, however. If you want a track day car, I think the E30M3 is far superior. Last edited by Ironhead; 04-14-2018, 07:00 AM. Yep, I know of a clean one for sale, Euro spec 5spd. Was thinking about using it as an occasional DD since I don’t dare drive my E30 M3 as much these days. The roads I drive are pretty twisty, no highway, so it would be fun to wind it out and row the gears to + from work. I have driven regular 190E’s, although only automatic, and they are still fun due to their small size like an E30 - just not the thrilling ride that an E30 can be. I figured a 16v 190E would be a noticeable step above in driving entertainment. I hear what you are saying. I have just come to the point that for a DD I want something Japanese, moderately priced, that gets good gas mileage, and is 100% reliable. I stopped several years ago trying to merge toy cars with cars that I need for transportation. The demands of each are kind of irreconcilable. I bounce back and forth between German toys and Japanese appliances. The appliances are just so boring.... I miss the soul of a driver’s car. Interesting video - that’s quite a collection. Good info on the 2.3-16 - I will probably drop you a line if I go forward on the car. 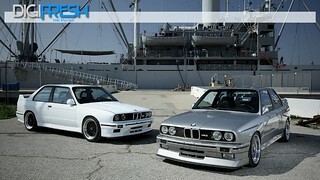 I´ll have e30 M3 and 2.5-16 Mercedes. If I have to choose one and drive that for the rest of my life, then it is Mercedes. If both of these cars are with original suspension and original tyre sizes, then there is only very small difference. Mercedes feels a bit softer, but it has also better sound insulation and that is maybe one reason, why people say it is not as sportier than M3. Having driven a euro spec and us spec 2.3-16, the only car worth having is the euro spec. The Merc is well built and people like the rigidity. However, the price is a heavier more complex car. The euro spec car with c/r gearbox is awesome but even then it's only on par with the US E30 M3 in stock form without a chip, not counting the weight disadvantage. I think they are cool and love the styling. I tried to convince myself to get one many years ago but missed the boat as I would only want the euro version with a manual and those are harder to find. Pick it up if you can get a fair deal on it. Perfect car to add to the collection but if I could only have one it would be the M3 all day. Last edited by Reelizmpro; 04-16-2018, 06:20 AM. Yeah, it would be a supplement to my E30 M3, not a replacement by any means. Just looking for a fun sometimes-DD car. Definitely appreciate all the comments. Keep ‘em comin’! All times are GMT-12. This page was generated at 05:32 AM.